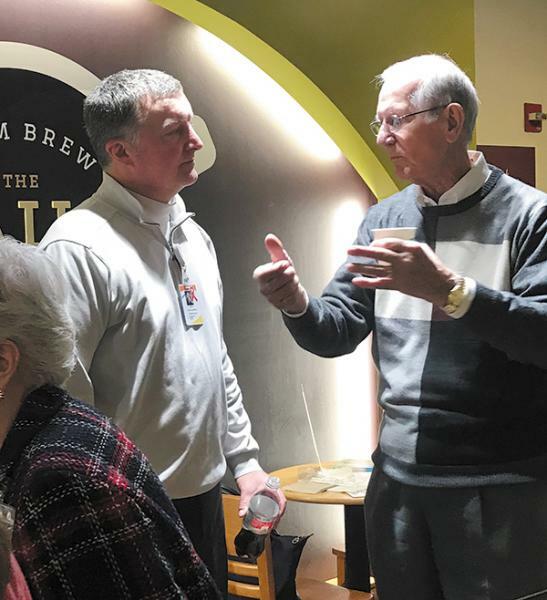 Tim Puthoff, left, visits during a 'CEO Coffee with the Community' event. Tim Puthoff returned to Alabama in January to serve as Chief Executive Officer for Brookwood Baptist Medical Center and Tenet's Alabama and Tennessee Group. He is responsible for all strategic, operational and clinical activities at Brookwood Baptist Medical Center as well as providing oversight at all five hospitals in the Brookwood Baptist Health system and Tenet's Tennessee hospital operations. For the past five years, Puthoff served as CEO of Houston Northwest Medical Center where he led Houston Northwest in significant growth, including increases in admissions, surgeries, and Emergency Department visits. Under his leadership, the hospital scored well above national averages in the AHRQ Culture of Patient Safety Survey. Having worked for Tenet previously, Puthoff is familiar with Brookwood and the Tenet systems. "I know what a wonderful facility Brookwood Baptist has been over the years, and I was excited for the opportunity to help lead a system that has such a prevalent role in the market," he says. Puthoff plans to employ strategies specific to Brookwood Baptist and Tenet, but he will first take time to identify the needs of the health system. "It's a bit early to talk about strategies because I am still learning about the organization," he says. "Overall, I think we will continue to develop our primary care base. We have opportunities with the neurosciences, and we can be a leader in stroke care in the Birmingham area. I want us to continue to improve what I think is already the leading cardiovascular services in the city at Brookwood, Princeton and Shelby. I am excited about further development of that service line." Infrastructure improvements are also on Puthoff's list. "We are investing $80 million in our facilities which includes new equipment and renovations. We will see a lot of noticeable improvements in the Brookwood facility and other hospitals in the system," he says. Projects nearing completion at Brookwood Baptist include the addition of a new state-of-the-art electrophysiology lab, new linear accelerator for advanced cancer treatment, new 3T MRI, expansion of the hospital's sterile processing area and renovations to the hospital lobby. Upcoming projects include the purchase of three new cardiac catheterization labs, expansion and renovation of the GI procedure area and a fully-renovated orthopedic and neurology patient floor. Adding to its capital investments and touching on Puthoff's desire to be a leader in stroke care in Birmingham, Brookwood along with Shelby, Princeton and the Brookwood Freestanding Emergency Department recently deployed the RAPID imaging platform from iSchemaView, bringing the most advanced brain imaging software platform for identifying treatment options for stroke patients. RAPID is a new class of automated brain imaging software that allows doctors to quickly visualize reductions in blood flow to the brain and early signs of brain injury. "We are also working with our marketing and public relations staffs in an effort to be a more visible part of the Birmingham community from both a patient and provider standpoint," Puthoff said. "We want people to know the Brookwood system and the great things we are doing in our hospitals." Healthgrades, a leading online resource for comprehensive information about physicians and hospitals, has already recognized the Brookwood system's accomplishments. It recently acknowledged Brookwood Baptist Medical Center's excellence in Healthgrade's 2019 Report to the Nation as one of America's 100 Best Hospitals for orthopedic surgery and spine surgery. Brookwood Baptist Medical Center is the only hospital in Alabama to be recognized in both surgical categories for 2019. "There is a lot to be proud of at Brookwood," Puthoff says. "Our patient satisfaction and overall quality scores are outstanding, and we will continue to work to improve in these areas. The care that is delivered in our organization is second to none in Birmingham, and we have a wonderful staff and a dedicated group of doctors. My priority is to build on the strong foundation we already have and to help grow our health system in the years to come."